Pay only $648 when you pay in full! In QC’s online Wedding Planning course, you’ll learn how to help couples achieve the wedding of their dreams. This course provides you with practical planning tools, so you’ll be ready to take your client’s ideas and turn them into reality. 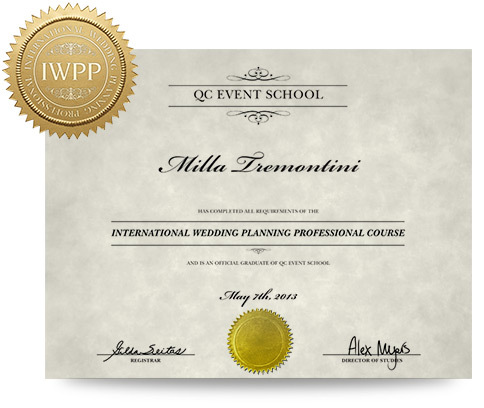 Once you graduate from QC’s Wedding Planning course, you’ll receive a certificate of completion and the professional designation of International Wedding Planning Professional (IWPP). Your designation demonstrates your credibility as a wedding planner, and will help you develop positive relationships with clients and industry professionals. Explore the ways in which you’ll create unique wedding concepts for your clients, focusing on various components. Learn about the wedding timeline and process of planning a wedding, step-by-step. Understand how to work within your client’s wedding budget, prioritizing elements that matter most to each couple. Learn the considerations for selecting a venue that contributes to your concept. Find out how to select an appropriate caterer for your client’s wedding. Discover how to help your clients create a guest list, and learn the roles of the wedding party. Learn how to plan pre-wedding parties, from the bridal shower to the rehearsal dinner. Study wedding attire and aesthetics, from wedding dress styles and dressing the wedding party. Discover what’s involved in both civil and religious wedding ceremonies, and learn how you can personalize the ceremony for your clients. Study how weddings are celebrated across a variety of different religions and cultures. You’ll learn tips for bringing traditions together from multiple backgrounds. Learn about executing a seamless reception by coordinating with vendors, entertainment, and other staff. Study the various types of businesses, financing and insurance options, and learn to write a business plan. Learn efficient ways to market and promote your wedding planning services to clients. Explore strategies for day-of problem solving as a wedding planner, so that your client’s big day can run smoothly. Learn effective project management strategies to keep your business running efficiently. QC sends you everything you need to complete your course, including lesson texts, course guides, and video tutorials on DVDs. You’ll gain lifetime access to the Online Student Center where you’ll find electronic copies of your course materials. Here, you’ll submit assignments, connect with peers, and review your tutor’s evaluation and audio feedback. 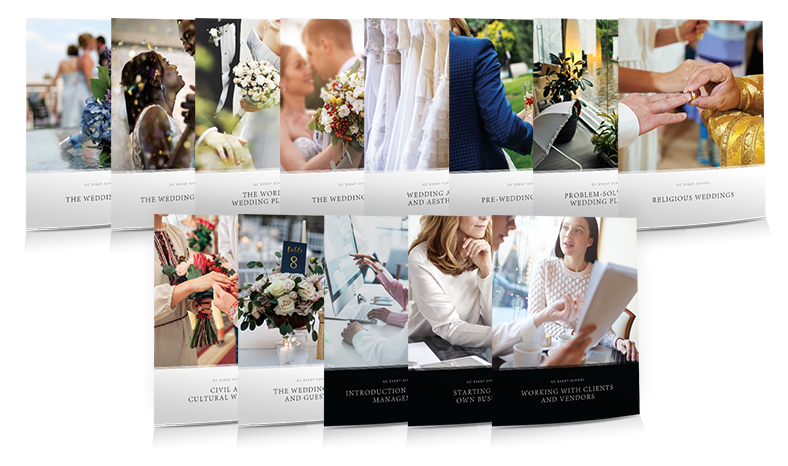 Download a Course Preview to get an inside look at the Wedding Planning course. If you have a passion for planning weddings and enjoy meeting new people, a career in the event and wedding industry sounds right for you. With QC, you’ll never be alone—we’re here to support you every step of the way! Enroll today and take the first step towards a brighter future.